The magnitude of Egypt’s beauty lies in her sands of time, an incredible place rich in culture with colourful markets and endless deserts. Just outside city walls are colossal Sphinx statues sitting perfectly still next to ancient pyramids. To make things a little easier, we’ve put together a short guide on 5 cities to visit in Egypt. These cities hold the key to unlocking Egypt’s past as you pass through places that have stood the test of time. You can begin to gain a sense of how profound it was for the ancient Egyptians to craft and rule a highly detailed civilization as you walk like an Egyptian through these incredible cities. Egypt’s historic capital is a perfect starting place for any trip to the area. Located on the Nile River, this city blends a mix of modern and ancient architecture. Located in Cairo is the Egyptian Museum, which contains some of the most fascinating artefacts from the past. 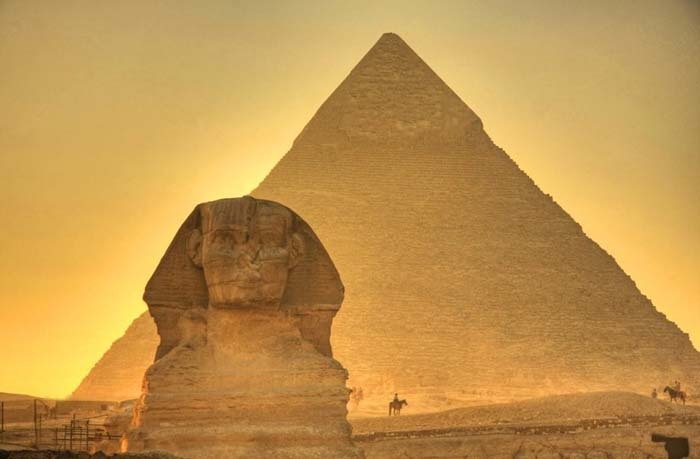 A short tip outside Cairo takes you to the city of Giza, famous for housing the Great Pyramids and the Great Sphinx. The only remaining ancient wonders of the world. Try seeing the pyramids at night where they light up during a laser show. Where to Stay: The Ramses Hilton has a reputation as being one of the best hotels in Cairo. At around $140 a night it is affordable and has a great view of the Nile River. Where to Eat: Try the Zooba restaurant for an authentic Egyptian meal at an affordable price. South of Cairo located on the Nile is the city of Aswan. This city is a perfect place to unwind and relax after seeing the nation’s capital. Be sure to see the unfinished Obelisk, one of the largest single rock carvings in the world. 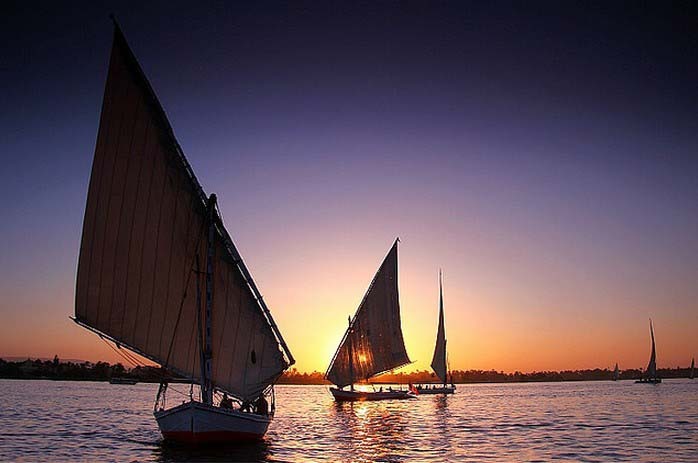 Spend a day relaxing sailing on a felucca, one of the Niles traditional white sail boats. A short day trip outside of Answan takes you to Abu Simbel, a gigantic temple constructed during the reign of Ramses II, this attraction is an absolute must for any Egypt traveller. Aswan is also home to many different traditional markets and bazars. Have fun shopping around for different bargains, but be sure to haggle hard! Where to stay: The Keylany Hotel has a quirky Egyptian décor with all the amenities you need. It goes for around $92 a night. Where to eat: The Panorama Restaurant offers views of the whole city whilst serving a selection of different Middle Eastern dishes. The city of Luxor is the second most visited city in Egypt, and possesses some of the most famous attractions. Have a look around the Temple of Luxor and Temple of Karnak, and gaze in wonder into the detail of the hieroglyphics. In between these two temples lies the Avenue of the Sphinxes. A shell of its former beauty, this path was believed to have over 2000 Sphinxes in its prime. No trip to Luxor is complete without a trip to the Valley of the Kings. This ancient burial site of former Egyptian kings is most famous for the discovery of the tomb of Tutankhamen. Just past the valley are the Colossi of Memnon, two enormous monuments depicting the Pharaoh Amenhotep III. Where to stay: For value for money don’t look past the Saint Joseph Hotel. At around $50 a night it has a great location in the heart of the city. Where to eat: The Latern is a hot spot for luxury diners, however if you are feeling brave then go out and try some street food! Sharam El Sheik is a luxurious paradise located in the north of Egypt. Known for its pristine beaches and lavish resorts, Sharam El Sheik attracts thousands of tourists every year. Located on the red sea, it is also home to some of the best snorkelling and diving sites in the world. There are many different water sports and activities offered here. Be sure to scope out the night life, with its assortment of trendy bars and restaurants. Where to stay: Treat yourself and try the Jez Mirabel Beach Resort. Compared too many of the hotels in the area it is surprisingly affordable, and located directly on the beach. It will cost you about $140 a night. Where to eat: The Camel Bar and Roof is in a great location and offers cheap food with fantastic views. Alexandria is the second biggest city in all of Egypt. Located in the north of the country right on the Mediterranean Sea, the city is the nation’s largest sea port for imports and exports. The combination of warm weather and vast number of beaches makes it a popular place for visitors year around. Other popular sites here include the Bibliotheca Alexandria, Egypt’s largest library that is in a modern designed building surrounded by ancient structures. The Stanley Bridge offers a fantastic walk at night time, to take in some of the lights and sounds of the city. Where to stay: The Alexandria Mediterranean Suites is affordable and centrally located at around $70 a night. Where to eat: For a romantic setting, try the Greek Club. Located on the harbour is offers remarkable views.